In case you missed it, here’s an up-close look of the beacon atop Mt. Diablo. The beacon, known as the “Eye of Diablo”, is turned on every year for about 15 hours on Dec.7 to honor the victims and survivors of the attack on Pearl Harbor. 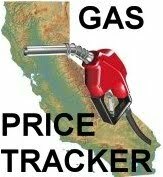 Thanks to Rich Lueck for the video. So…. it isn’t the Eye of Sauron? Probably won’t be attacked by Orks after all….sorry kids, false alarm. Well…. if nobody is going to leave even one serious comment I guess I’d better. The Beacon on Mount Diablo was originally installed and illuminated in 1928 to aid in trans-continental aviation. It is one of the four guiding beacons installed along the west coast by Standard Oil of CA and is the only one still operational. It was turned off at the beginning of WWII so as to deny the enemy any navigational aid. 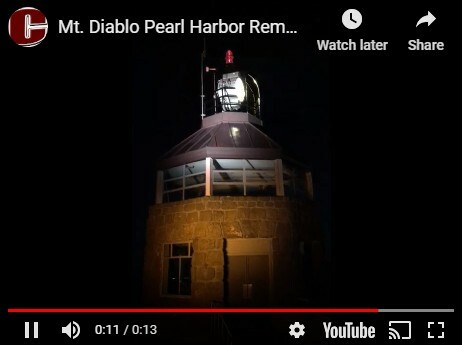 Every year since 1964, the Pearl Harbor survivors and their families have memorialized Pearl Harbor Day by relighting the historic Beacon atop Mount Diablo’s summit ……… a tribute to those individuals that lost their lives at Pearl Harbor and also to honor the survivors. I wonder if there are any other such Pearl Harbor Day memorial observances as unique as ours is? Pretty good opportunity to rethink how you approach most things you have posted here, Dr. Jellyfinger. I learned much more by attending the ceremony than what you have offered here – glib is nothing I would have considered after seeing three Pearl harbor veterans make their way into the hall, or listening to the historian talk about what he has taught, or even the 94 year old speaker describe what he went though that day . . . The flash of light from the beacon illuminated a darkly shadowed part of my garage wall in the Highlands. That’s one bright light !!! Salute to all the WW2 veterans. I look forward to this every year. It certainly changed a lot of lives, like mine. My dad was at Cal studying engineering on December 8th. He finished school and went straight to Naval Officer Candidate School in Phoenix. He used to laugh about the students learning to navigate by sighting their sextant on the top of the flag pole. Then he got sent to Chicago to build landing craft boats and met my mom who was working in the office. He joked about commanding an “LMD”. Large mahogany desk. Then sent out to Bremerton WA. As the war was ending there were a lot of hi-jinks. Like trading a barber chair for a landing craft that was very convenient for going around Puget Sound and setting up beach parties. Anyway, that’s the generation I came from and I salute it every year. And I remember all those that were killed and gone. We’ve got some of those in my family too. Very sad too. I am so very happy that I attended this years celebration of this celebration. There were three survivors of the attack at Pearl Harbor – and a story teller who helped people like me understand the significance, if not the personal experience of being there. What an amazing treasure that we have inherited the love from those who experienced the lost of their fellow soldiers in the attacks at Pearl Harbor . . .
and that those witnesses decided to erect a symbolic structure that would honor those who were lost that day. Many many thanks to those who lost loved ones, celebrate those, and help us remember this extremely important part of our history. Well…..I guess the “Holier Than Thou” award goes to the self righteous, self appointed, spokesperson for all who read Claycord, “Recall ‘Em All”…. Congrats REA. I for one look forward to seeing it lit up once a year, on a special day, commemorating those who fought and those who lost their lives, it’s a memorial, and some realization of how important this is, should be given deep thoughts, if this was a 911 memorial, that most of us have somewhat fresh in our minds, perhaps more people would realize the depth of this ceremony. I enjoy seeing the light also, especially since it was restored with a brighter lamp and the azimuth adjusted to make the light more visible to lower elevations. I can remember the original light from decades ago.